Where should your pet travel while in the car? 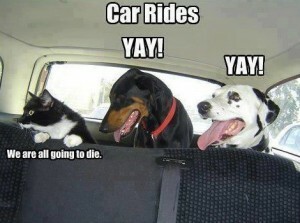 -Dogs shouldn’t roam in the car. The safest way for your dog to travel in the car is in a crate that has been anchored to the vehicle using a seatbelt or other secure means. -Cats belong in carriers. Most cats aren’t comfortable traveling in cars, so for their safety as well as yours, keep them in a carrier. -Leave the front seat for humans. Keep your pet in the back seat of the car. If an airbag deploys while your pet is in the passenger seat, it might injure your pet. -Keep those heads inside! Dogs and cats should always be kept safely inside the car. 2. Any medications or other treatments your pet might need. 3. Updated I.D. tags for travel with information on how to reach you while on your trip. 5.Food and Water Bowls. You can find collapsible bowls at your local pet store that are perfect for traveling. 7. Proper I.D. and collars. These should be kept on at all times during travel. 8. A photo of your pet, just in case they become lost! 9. A favorite toy or ball. 10. If you are using a portable carrier, make sure your information is clearly labeled. – If your pet is prone to motion sickness, or if you just want to prepare, you can ask your veterinarian for anti-nausea or sedating medication for your pet. – Before you place your pet in their carrier, attach their collar and/or leash. This is helpful in eliminating a struggle to attach the leash when the carrier door is opened. – Bring their usual food, or make sure it will be available at their destination. – If your pet sleeps in a special bed or bedding, bringing this along will help them feel at home. – Give your pet plenty of rest stops. Stop frequently to allow your pet to exercise and eliminate. -Bring along a human buddy. You’ll be able to get food or use the facilities at rest stops knowing that someone you trust is keeping a close eye on your pets. Be sure to contact the airline in which you are traveling for their policies on flying pets. Airlines require animals to be at least 8 weeks old and fully weaned. 2. Fly direct when possible. 3. Only pets in good health and behavior should fly. 4. Bring copies of current medical records and vaccination records. 5. Contact your airline to reserve a space for your pet as soon as possible and confirm within 36 hours of flying. 6. Feed your pet within 4 hours of check in, and bring water for rehydration while waiting for boarding. 7. Travel with plastic, not wire carriers, as no part of the pet should protrude. 8. Make sure the carrier you’re using fits your pet. They should be able to stand and turn. 9. Carriers should have a solid floor with something absorbent, like a towel or blanket, in case of accidents. And there you have it! Safe Travels to you and your furry pals from Wetzel Auto!